Now that I&apos;ve convinced you (I hope!) 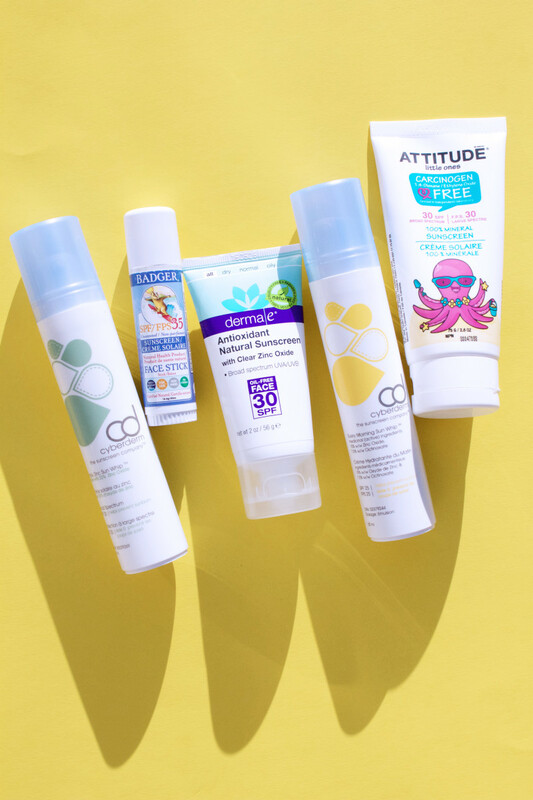 that mineral sunscreen is better than chemical, I&apos;m back with the most important part—product suggestions! 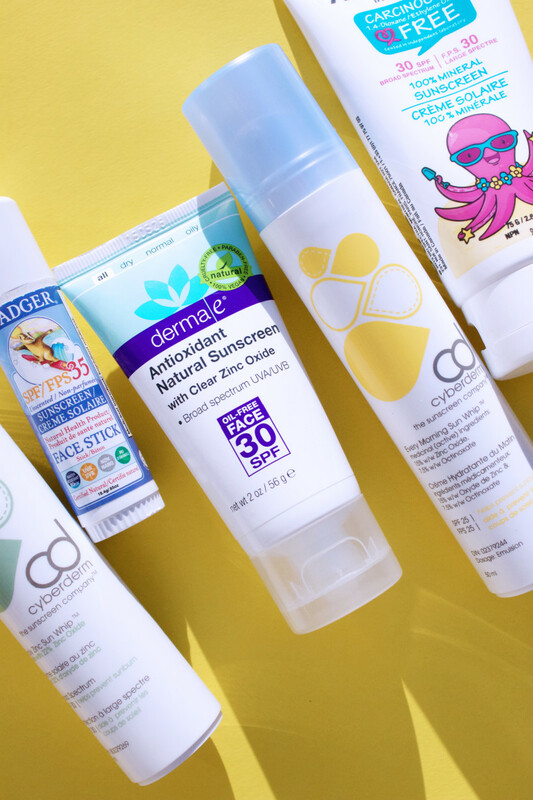 Because you see, not all mineral sunscreens are created equal. It would be great if we could just look for the words "mineral" or "zinc oxide" on a label and be done with it. But the reality is, that alone doesn&apos;t necessarily mean you&apos;re getting adequate or safe sun protection. The concentration and combination of ingredients also matter, along with whatever else is in the formula. Look for 20 percent zinc oxide formulas, or 15 zinc oxide combined with at least 7.5 percent titanium dioxide. Of any filter—mineral OR chemical—zinc oxide gives you the most effective full-spectrum protection against UVA and UVB rays. Say no to any sunscreen that only has titanium dioxide. While a mineral, it doesn&apos;t provide good enough protection against UVA rays (a.ka. the aging type of rays!). More details here. 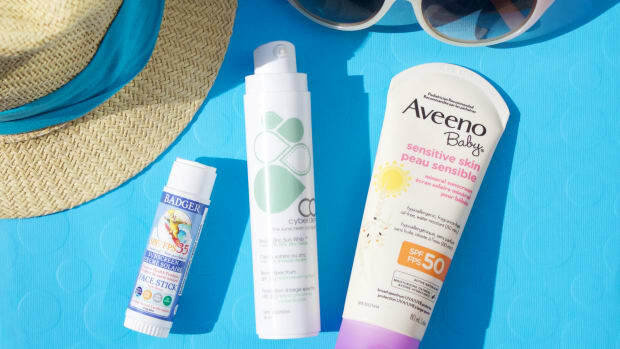 According to The Sunscreen Doc, every one percent of zinc oxide gives you 1.6 SPF units. That means a 15 percent zinc oxide formula works out to about SPF 24 (which is on the low side). The higher the zinc, the higher the SPF. So a zinc oxide concentration of 20 percent or more would be even better, and reach the recommended SPF 30 minimum. 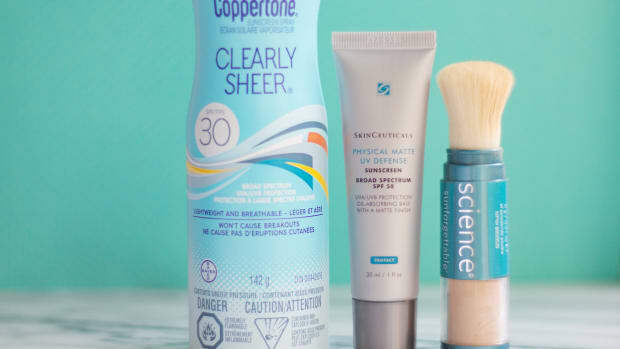 Ideally, any formulas with less than 20 percent zinc oxide should also have other filters—otherwise the SPF could be too low to properly protect you, and may be inadequate against UVA rays. This is your other option. If you&apos;re seeing 15 percent zinc oxide, there should also be at least 7.5 percent titanium dioxide. This will get you to SPF 30, with adequate UVA protection, says The Sunscreen Doc. An alternative to titanium dioxide, that can be combined with zinc oxide, is encapsulated octinoxate. Although a chemical, encapsulating it makes it behave like a mineral—so it will sit safely on top of the skin instead of absorbing into the bloodstream. CyberDerm is the only company I know of that is using this technology (see below!). I try to avoid products high in polyunsaturated oils (PUFAs), especially in sunscreens. Why? Because these unstable oils will easily go rancid (oxidizing) when exposed to heat and light. In fact, they even interact with ultraviolet radiation to produce toxic free radicals that cause cellular damage. That means aging! Coconut oil, shea butter, cocoa butter and olive oil are all safe. But you should avoid sunscreens that are high in PUFA oils such as safflower, grape seed, corn, soybean, sesame, sunflower and almond. If they&apos;re one of the first five ingredients (which typically comprise about 80 percent of the product), I would not use it. As you can imagine, finding products that tick off all these boxes is TOUGH—never mind other aesthetic concerns such as being non-whitening, and silicone-free! 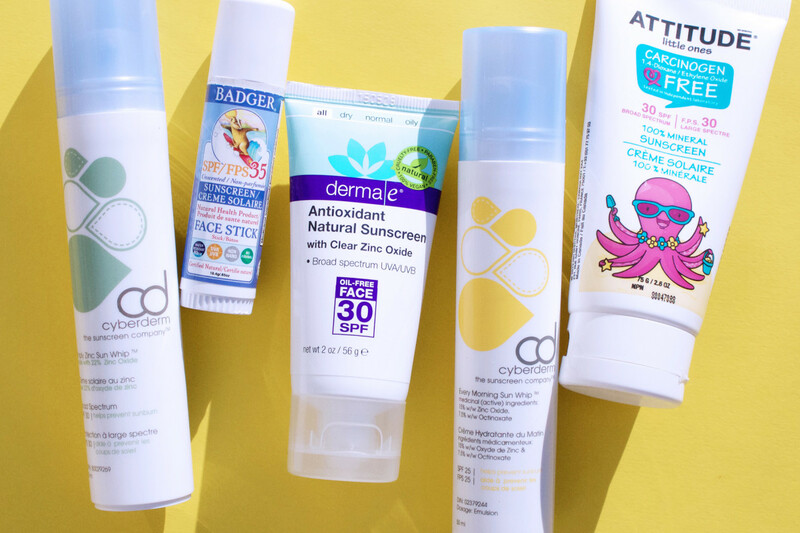 Until the sunscreen manufacturers get their act together and start upping their formulation game, there are only a handful of decent options I&apos;m willing to put on mah precious face. 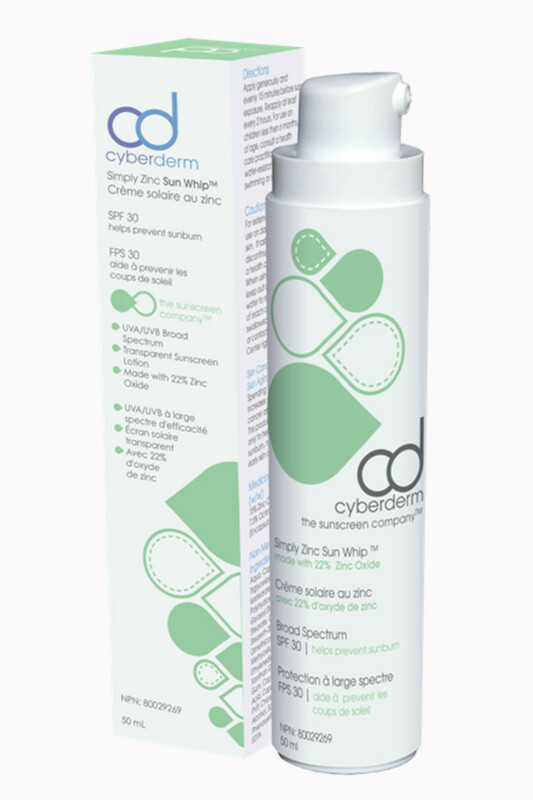 CyberDerm Simply Zinc Sun Whip SPF 30 is a 22 percent zinc oxide formula in an olive oil base with anti-aging peptides. It&apos;s non-nano, non-whitening and silicone-free. I&apos;ve used this for several years now, especially at the beach, and it seriously protects! Active Ingredients: (w/w) 22% Zinc Oxide. Inactive Ingredients: Aqua, Caprylic/Capric Triglyceride, Glyceryl Isostearate, Polyhydroxystearic Acid, Cetearyl Olivate, Sorbitan Olivate, Methylcellulose, Tetrapeptide-21, Caprylhydroxamic Acid, Caprylyl Glycol, Glycerin, Phenoxyethanol, Xanthan Gum, Butylene Glycol, Benzoic Acid, Dehydroacetic Acid. 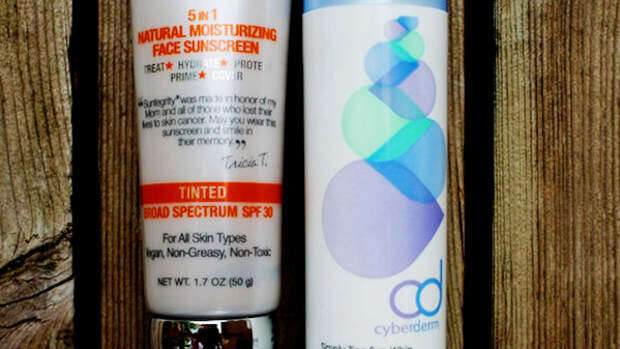 CyberDerm Every Morning Sun Whip SPF 25 is a 15 percent zinc oxide and 7.5 percent encapsulated octinoxate formula. (Again, the octinoxate acts like a mineral here, staying on the skin&apos;s surface thanks to the encapsulation technology.) If you have oily or acne-prone skin and find the olive oil in Simply Zinc too moisturizing, you may find this a little lighter. Note that this one does have silicone, although it&apos;s not high on the ingredients list. Active Ingredients: (w/w) 15% Zinc Oxide (ZinClearTM), 7.5% Octinoxate (Encapsulated). Inactive Ingredients: Aqua, Caprylic/Capric Triglyceride, Glyceryl Isostearate, Polyhydroxystearic Acid, Glyceryl Stearate, PEG-75 Stearate, Ceteth 20, Steareth-20, Glycerin, Cetyl, Dimethicone, Methylcellulose, Trisodium Ethylenediame Disuccinate, Xanthan Gum, Sclerotium Gum, Caprylhydroxamic Acid, Caprylyl Glycol, Silica, PVP, Chlorphenesin, Cetyl Alcohol, Sodium Citrate, Phenoxyethanol, Disodium EDTA. 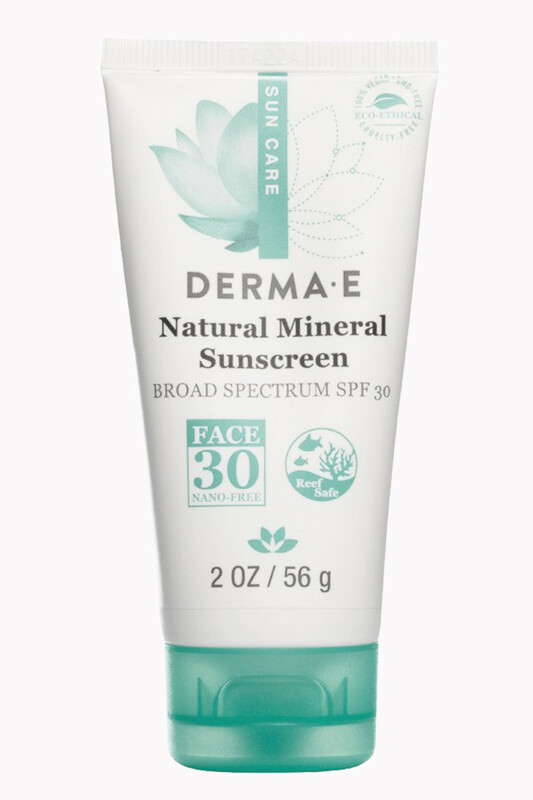 Derma E Natural Mineral Sunscreen Broad Spectrum SPF 30 Oil-Free Face is a new and improved version of their original sunscreen, now with an even higher level of protection. Previously, it only had 16 percent zinc oxide for an SPF 25; now, you&apos;re getting 20 percent zinc and SPF 30. I love the light texture of this formulation, which is oil-free, non-whitening and non-nano. The ingredients are definitely on the more natural side. This would suit all skin types. Active Ingredient: Zinc Oxide 20%. Inactive Ingredients: Purified Water, Coco-Caprylate (Coconut Derived), Dicaprylyl Carbonate, Lauryl Glucoside (Plant Derived), Polyglyceryl-2 Dipolyhydroxystearate, Glycerin (Vegetable Derived), Microcrystalline Cellulose (Plant Derived), Cellulose Gum (Plant Derived), Organic Camellia Sinensis (Green Tea) Leaf Extract*, Panthenol (Provitamin B5), Sodium Ascorbyl Phosphate (Vitamin C),Tocopheryl Acetate (Vitamin E), Phytic Acid, Triethoxycaprylylsilane, Polyhydroxystearic Acid, Xanthan Gum, Benzyl Alcohol, Ethylhexylglycerin, Tocopherol. 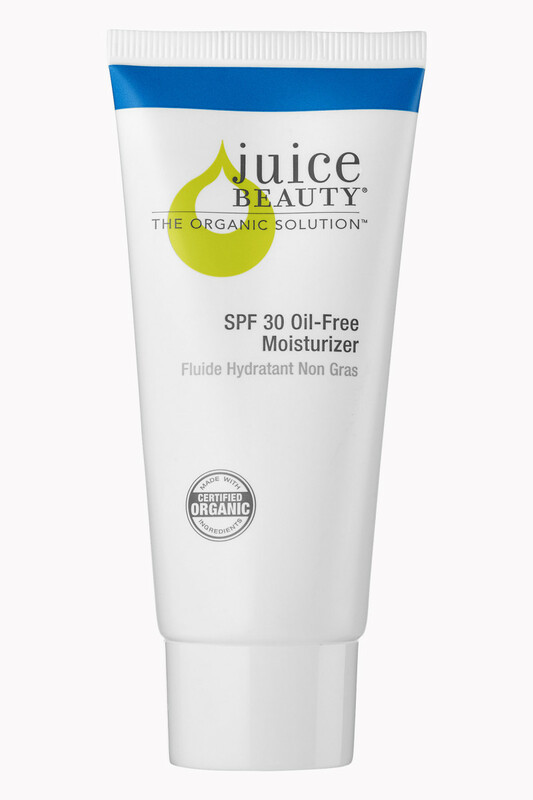 Juice Beauty SPF 30 Oil-Free Moisturizer is a 20 percent zinc oxide in an oil-free aloe vera base. Lots of lovely organic stuff in here, and no silicones or nanoparticles. 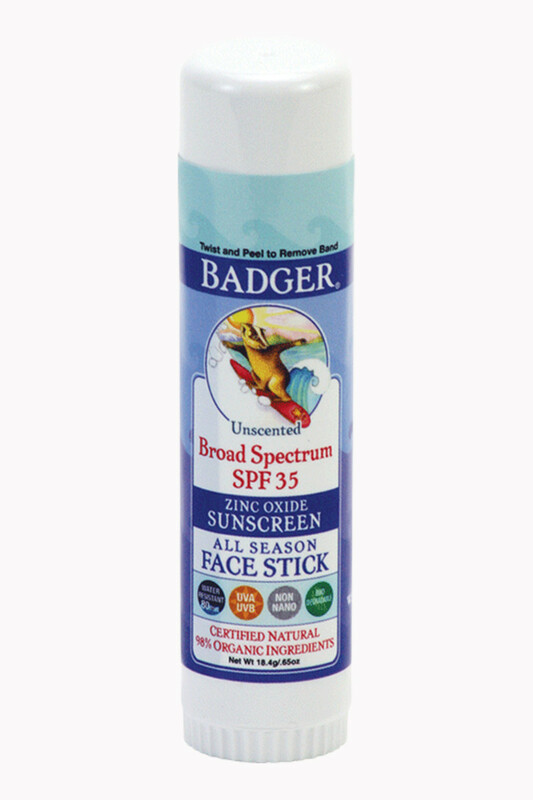 Badger All Season Face Stick SPF 35 has 22.5 percent zinc oxide, the highest on this list. Only the paler peeps will be able to get away with this one, because it is on the whitening side. The zinc is non-nano, and the ingredients list could not be cleaner—or shorter! 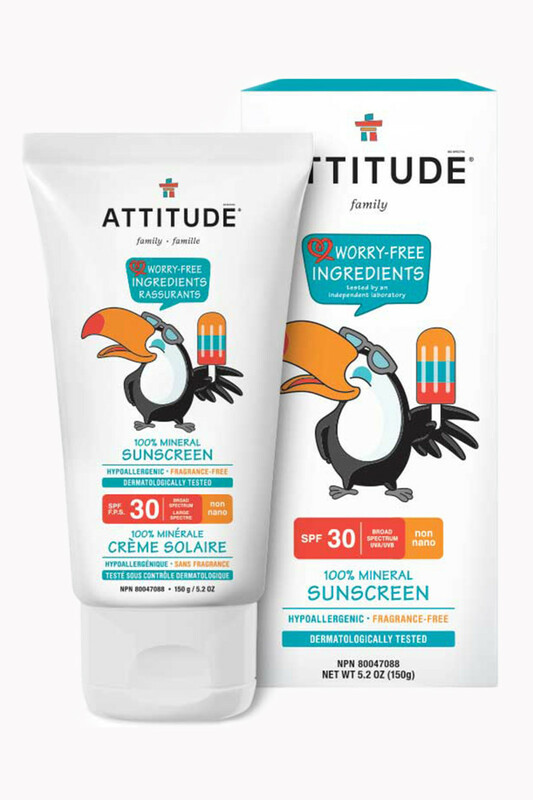 Attitude 100% Mineral Sunscreen SPF 30 has 20 percent non-nano zinc oxide in a hypoallergenic, fragrance-free, non-whitening formula. I love the non-greasy texture of this one! Active Ingredient: Zinc oxide (20%). Inactive Ingredients: Aqua/water/eau, caprylic/capric triglyceride, cetearyl alcohol, cetearyl glucoside, glyceryl isostearate, glycerin, polyhydroxystearic acid, sodium stearoyl glutamate, ethylhexylglycerin, caprylyl glycol, xanthan gum, niacinamide, tetrasodium iminodisuccinate. 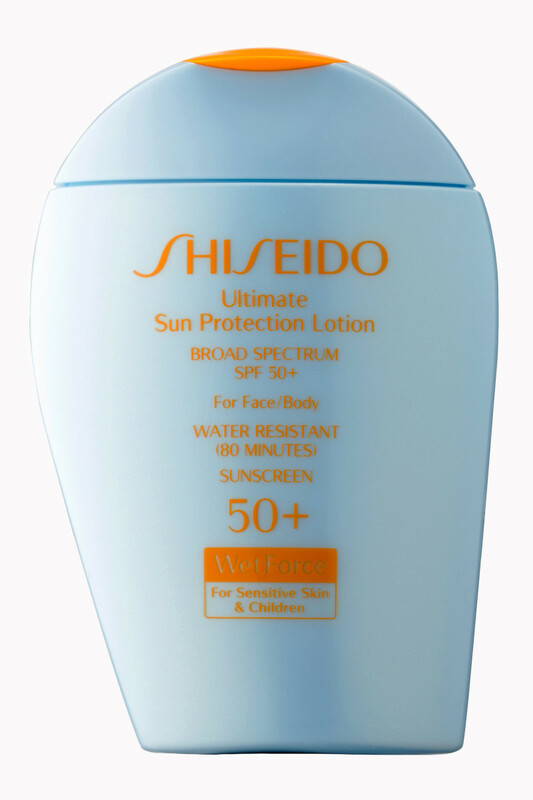 Shiseido Ultimate Sun Protection Lotion SPF 50+ WetForce for Sensitive Skin & Children is high in both zinc oxide and titanium dioxide (ringing in at 19.3 percent and 9.1 percent respectively). It&apos;s also water-resistant. However, it is also high in silicone, so best kept for days when you&apos;re swimming or sweating outdoors. Active Ingredients: Titanium Dioxide 9.1%, Zinc Oxide 19.3%. Inactive Ingredients: Dimethicone, Water, Butylene Glycol, Glycerin, Diisopropyl Sebacate, Polymethyl Methacrylate, Hydrogenated Polydecene, Peg-10 Dimethicone, Cyclomethicone, Peg-9 Polydimethylsiloxyethyl Dimethicone, Bis-Butyldimethicone Polyglyceryl-3, Peg-6, Trimethylsiloxysilicate, Peg-32, Peg/Ppg-14/7 Dimethyl Ether, Scutellaria Baicalensis Root Extract, Rubus Idaeus (Raspberry) Fruit Extract, Aloe Barbadensis Leaf Extract, Thymus Serpillum Extract, Aluminum Distearate, Aluminum Hydroxide, Hydrogen Dimethicone, Isostearic Acid, Disteardimonium Hectorite, Hydrated Silica, Sodium Metaphosphate, Triethoxycaprylylsilane, Stearic Acid, Dextrin Palmitate, Distearyldimonium Chloride, Tocopherol, Syzygium Jambos Leaf Extract. 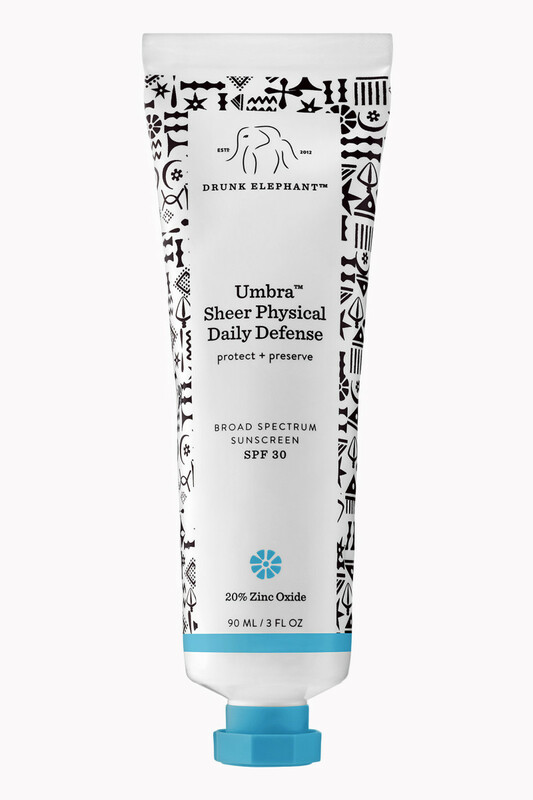 Drunk Elephant Umbra Sheer Physical Daily Defense SPF 30 is a high-zinc (20 percent), silicone-free formula with mostly natural ingredients. It&apos;s non-whitening (no rubbing required) and has a tiny bit of luminosity to reflect the light. Note that there are some unstable oils in here, but they&apos;re in such low amounts, I don&apos;t think they&apos;re too much of a worry. Active Ingredient: Zinc Oxide 20%. Other Ingredients: Water, Caprylic/Capric Triglyceride, Dicaprylyl Carbonate, Glycerin, Pentylene Glycol, Steareth-2, Propanediol, Steareth-21, Polyhydroxystearic Acid, Cetearyl Alcohol, Silica, Sclerocarya Birrea Seed Oil, Aloe Barbadensis Leaf Extract, Chondrus Crispus Extract, Haematococcus Pluvialis Extract, Helianthus Annuus (Sunflower) Sprout Extract, Vitis Vinifera (Grape) Juice Extract, Helianthus Annuus (Sunflower) Seed Oil, Simmondsia Chinensis (Jojoba) Seed Oil, Raspberry Seed Oil/Tocopheryl Succinate Aminopropanediol Esters, Hydrolyzed Wheat Protein, Tocopheryl Acetate, Tocopherol, Sea Water, Acetyl Glucosamine, Cetearyl Glucoside, Sodium Stearoyl Glutamate, Tetrahexyldecyl Ascorbate, Glycine, Sucrose, Lecithin, Triethoxycaprylylsilane, Xanthan Gum, Trisodium Ethylenediamine Disuccinate, Caprylhydroxamic Acid, Mica, Caprylyl Glycol, Phenoxyethanol, Titanium Dioxide (CI 77891), Iron Oxides (CI 77491). 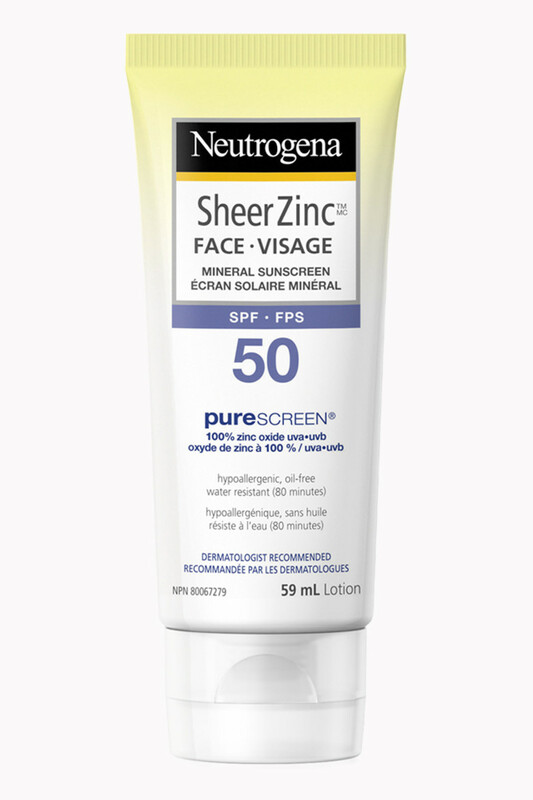 Neutrogena Sheer Zinc Face SPF 50 is one of the most affordable options here, and widely available at drugstores. Surprisingly, it&apos;s also got one of the highest concentrations of zinc, 21.6 percent, for a broad-spectrum SPF 50. The one downside is that it does contain silicones. Active Ingredient: Zinc Oxide/Oxyde de zinc (21.6%). Other Ingredients: Acrylates/Dimethicone Copolymer, C12-15 Alkyl Benzoate, Caprylyl Glycol, Cetyl Dimethicone/Bis-Vinyldimethicone Crosspolymer, Cetyl PEG/PPG-10/1 Dimethicone, Chlorphenesin, Chrysanthemum Parthenium (Feverfew) Flower/Leaf/Stem Juice, Colloidal Oatmeal, Dimethicone, Ethyl Methicone, Glycerin, Glyceryl Behenate, Octyldodecyl Citrate Crosspolymer, Phenethyl Alcohol, Phenoxyethanol, Phenyl Trimethicone, Polyhydroxystearic Acid, Silica, Sodium Chloride, Styrene/Acrylates Copolymer, Tocopheryl Acetate, Water (eau). 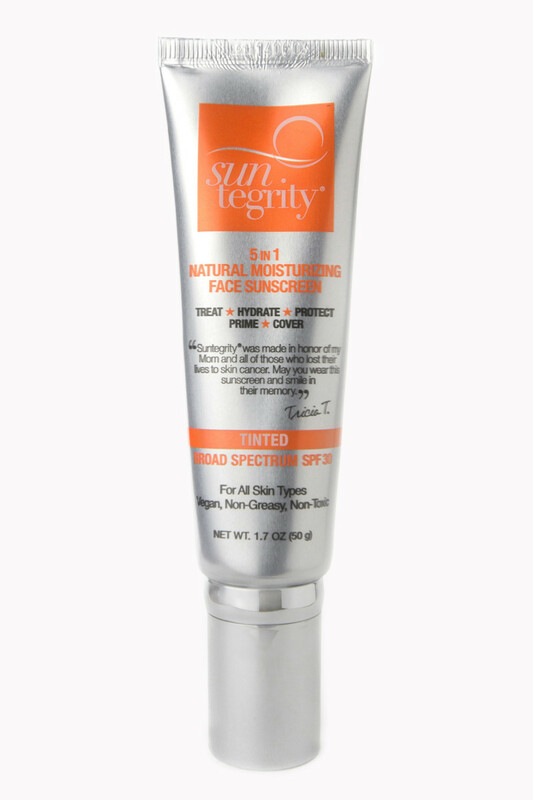 Suntegrity 5-in-1 Natural Moisturizing Face Sunscreen SPF 30 is a tinted sunscreen that could double as a light foundation. It comes in four shades, from fair to medium, and boasts 20 percent zinc oxide protection. There are low amounts of unsaturated oils and silicone, which shouldn&apos;t be a concern. 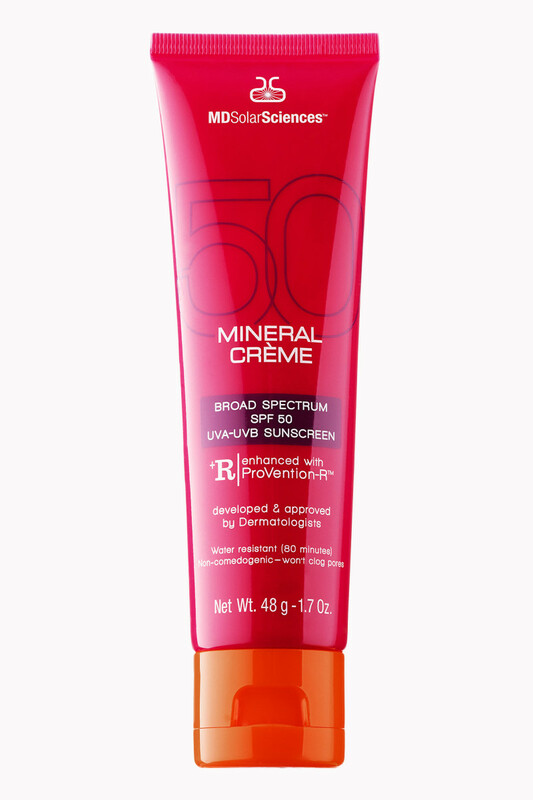 MDSolarSciences Mineral creme Broad Spectrum SPF 50 UVA-UVB Sunscreen falls just short of my criteria, but is still a pretty good option. The zinc oxide content is fairly high (17 percent), rounded out with a two percent titanium dioxide. The company says they don&apos;t use nanoparticles, but it does contain quite a bit of silicone. Medicinal Ingredients: Zinc Oxide (17%), Titanium Dioxide (2%). Non-Medicinal Ingredients: Dimethicone, Dimethicone Crosspolymer, Caprylic/Capric Triglyceride, Glyceryl Isostearate, Polyhydroxystearic Acid, Silica, Dimethicone/Vinyl Dimethicone Crosspolymer, Butyloctyl Salicylate, Polysilicone-15, Iron Oxides, PEG/PPG-18/18 Dimethicone, Triethoxycaprylylsilane, Tetrahexyldecyl Ascorbate, Camellia Sinensis (Green Tea) Extract, Vaccinium Macrocarpon (Cranberry) Fruit Extract, Punica Granatum (Pomegranate) Extract. High-zinc sunscreen offers the most effective protection against UVA and UVB rays. I hope you find at least one formulation on this list that you&apos;ll consider as your trusted facial sunscreen this summer. Let me know what you think—and tell me if you&apos;ve found any other great products out there! The mineral sunscreen struggle is REAL. What&apos;s your favourite mineral sunscreen?